Really big! Each bottle holds 32 oz of water and includes a large infusion chamber. Easy to carry thanks to a comfortable side grips. Include a free insulated sleeve to prevent condensation. Feature an easy-open flip top and wide drink spout. Three winners will each receive one bottle. The bottles are charcoal, pink, and green; each winner’s color will be randomly seleccted. The contest ends one week from today on November 14th. US residents only. 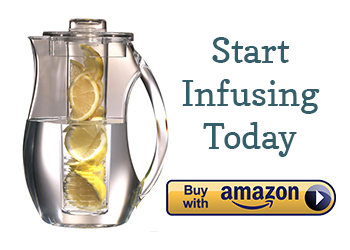 These infuser bottles are a best seller on Amazon and can also be purchased through Infuse Fruit directly. I keep an Infuse Fruit bottle at work for daily infusions. The bottle is easy to grip and carry, plus looks great. I always get compliments! 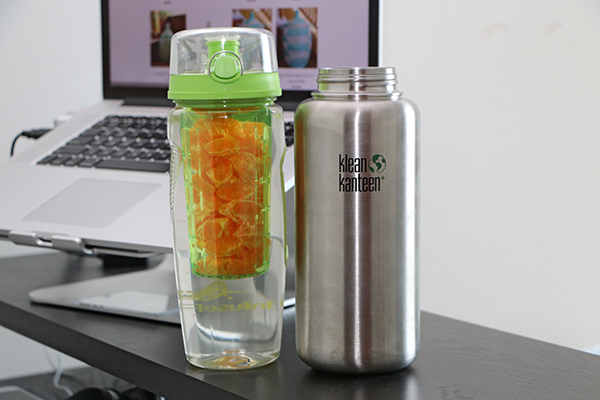 The Infuse Fruit bottle stacks up to my trusty Klean Kanteen water bottle that I’ve used for years and highly recommend for daily water intake. Thanks for entering! I’ll announce the winners on this post and Facebook next week. A special thank you to Lucky Contests, Contest Girl, ContestBee, SweepsAdvantage, SweepstakesBug, InfiniteSweeps, OnlineSweepstakes, DoublePrizes, and CoolFreebies, and Giveaways for helping us to promote for this contest! I would love to win this giveaway! I have been looking for a nice big bottle like this for awhile!! Thanks, Sally! I just added “leave a blog post” to gain an entry, and made sure you had an entry counted. Have a great night! I would love to win one of these bottles, I’ve been looking for a nice big infusing bottle for a while but always find that they tend to get condensation on them so when I want to carry it around I end up with a wet bag, I love how they have there own like sweat bag to keep them in to stop that from happening! Thanks for your comment, Tara. The sleeve is a nice bonus! I can’t wait to get one! It will really help me with my water intake. I have a severe sulfite allergy/sensitivity so I am basically limited to water and milk as the only beverages I can tolerate. The infused water has become a staple for me. Wow, these do an amazing job at actually making water look appealing! I get most of my water in by drinking Crystal Light, but I hate that it has artificial sweeteners. I could actually see myself drinking more water using one of these. Love this! I hope to win this! I love everything from the size of the bottle to it’s whole appearance. I’d love to win because I try to drink water all the time…. trying hard to live a healthier life, 25 pounds down this year! I’d love to take it hiking with me! Thanks for the giveaway! This bottle is great! I love carrying water bottles with me to help increase my water intake each day. I would love to win so that I could experiment with the infusing. It sounds like a lot of fun. 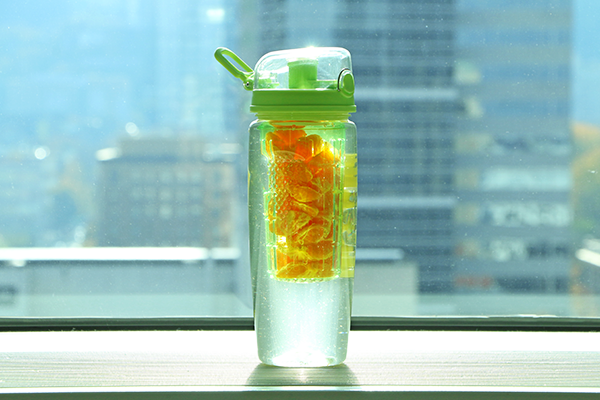 I would probably drink more water if I could have the taste of fruits along with it in an easy to carry bottle. This one would be perfect! I would love to win…this would help my poor water drinking habits! What as great giveaway. We’d love to feature some of your infused water recipes on our spa and wellness website as well. Switching to infused waters, or spa water as it has often been called, is a great way to wean you off soda or artificially sweetened beverages. It sure was helpful for me. I went from being a Diet Dr Pepper Fan, and weaned off that to tea with splenda, and weaned off that to fruit water, and now have a pitcher of water around me all the time, with fruits and herbs. It would be great to take one bottle on the road, too! That’s a great method, Kristina – thanks for sharing! These are cute and healthy! A great combo! This looks so good, fruit & water… Would love a water like this one. Looks absolutely awesome, water & fruit. Would love to get one of these for my mother cause she constantly talks about getting one but has yet to actually go out and buy one. I love water and I love the fruit, this combines both of them! yay!? this is really cool, thanks for the giveaway! I’ll definitely check out the larger site now. Sorry, Hennie, the contest is US only. I would love this to help me increase my water intake. I like that it’s leak proof! The size is great. I enjoy drinking infused water. I like the idea of no condensation. I would LOVE to have one of these bottles! Perfect for a healthy, although busy, lifestyle! Love the recipes too! I wanna win a infuser so I can start drinking more water, I love flavored water and its all natural stuff you can put in it to flavor it. I have just started drinking infused water and it is awesome. I would like to have one more bottle for my kid. I would love to win a bottle, because I think it would help me drink more water. Adding flavor to water would make me want to drink it more often. I have heard nothing but good things about these! I would like to win to remind me to drink more water & I like that I can ad fruits to it, I do not have one. I would love one of these to take back and forth between the gym and work! It’s perfect for both! I like the bottle doesn’t sweat. 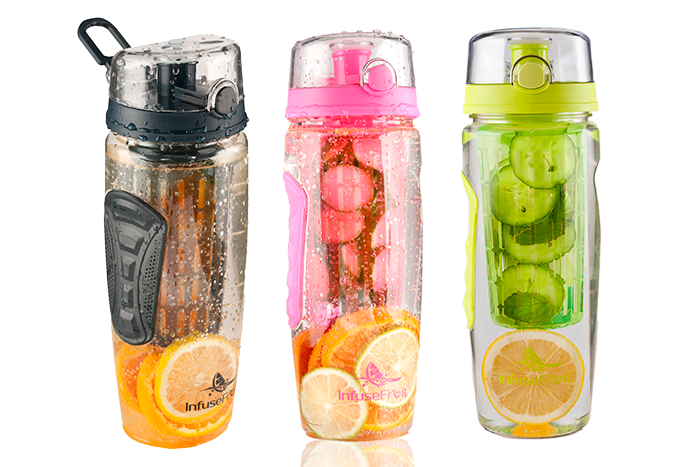 I would love to win an infuser water bottle so I can put fresh fruit in it and use it at the gym! This would help me cut costs and enjoy fruity flavored water. I was just introduced to fusion water. I love the idea of adding fruits and herbs and other alternative to make water an even more healthy drink. I love it! Looking forward to receiving my Infused Water bottle! This looks like a great way to add more water into my day! Thanks for the chance to win! Love the size and the colors. I also like the fact that it is leak proof. I’ve had more water bottles leak on my desk, in my car, or in my gym bag getting everything wet. It’ll be nice to have things stay dry. Hi, Jennifer. If you last name starts with an M, you won one of the infused water bottles! I’m having trouble reaching you by email, so please email me at infusedwaters@gmail.com if you see this. I would love to win this to try infusing my water. I have never had a infuse bottle. Maybe I would drink more water if I had a cool bottle like this one. I am so happy I just found you. I ordered one of the bottles for myself but would love to win one for my husband. We started on a healthier way to live journey in February of this year and between us we have lost 84 pounds! We are nearing our weight goals and water has become an important factor in our daily lives. I have a hard time drinking as much as I should but when it is infused, it is no trouble at all. like the large infuser that will hold alot of fruit to flavor the water. The pink color is my favorite! Infused water tastes so much better than plain water and these are perfect to take anywhere I want to go. I would love one of these super fantastic bottles. I have never even seen one before so it would be awesome to try out! I would love a bottle for a healthier life. I think this would help me a lot as i am not very healthy at the moment and i know i need to drink more water this would greatly help me and make water more tasty ! Those water bottles look awesome! Would love to win one and enjoy my fruit infused water in it! Thank you! I would love to win a bottle because I don’t drink enough water as is it but if I had one of these bottles it would entice me to try new flavor infusions and I would be more likely to get my recommended amount of water a day :)! As a nurse it would be wonderful to just be able to put my favorite fruit in and then refill the bottle as needed :)! This bottle would definitely help me drink more water every day! I love how big it is too! I love this giveaway! I am completely in love with the amazing health benefits and great taste associated with infused water! Additionally, these bottles have a gorgeous design and look perfect for everyday use! I have gone to a cafe’ that has made infused water and it was so good. I would love the chance to make it myself! Would like to receive one of these bottles to help me with losing some weight and maintain my blood sugar at a healthy level for my type 2 Diabetes. I’m new to infused water. Shopping around on where to start and this bottle looks the best!!! Today I was helping my friend to spread the word about holistic way of living and we ended up staying at a lady’s house for over 4 hours. She was nice to offer us some water. She brought a pitcher and I saw lime in it as well. I tried a sip and was carried away! Water tasted so refreshing and good! I drank 3 cups! Our next stop was a fruit stand 🙂 When I came home I tried to find something to infuse water with some limes I just bought, I found out that the only infuser the landlord had is missing a crucial part. The lid. I was destroyed. 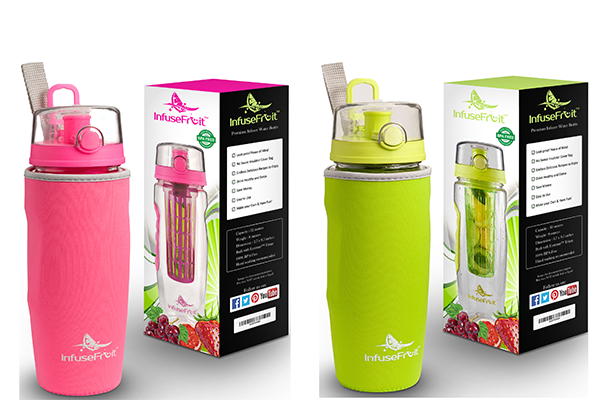 So I went online to look for some more info on infused water and found this giveaway of infuser water bottles!!! This is fantastic! God is so good! This is exactly what I need. Fingers crossed, I’ll win one and pass this amazing way of upgrading an essential habit all of us have – drinking water – and bring it to the next level in my community. Thank you! What a great and stylish way to get my daily intake of water. I want this bottle badly! I want this because I think it will help me drink more water. I would love to win these cool bottle and enjoy my water with a chic style ! Love the big size to enjoy more refreshing water, the cool leakproof and no sweat & cooler is awesome! Thanks for the amazing chance! Good luck everyone. I’very been trying to drink more water lately. This product will really help. Honestly I’ve wanted these so bad for a while now but my parents don’t allow me to buy it, hopefully I become a lucky winner! I think I am a month late in getting on your blog, but I just subscribed today so that in case you have contests like this I can also avail amazing freebies from you. Nice blog, by the way. hi Amy! i love your infuser is this available at amazon? because i lost my old infuser and i just found your’s and i like it so i need 1. thank you . good day! I have been looking for something like this , really need to detox and stay focused, winning one would really make my day and keep me more on track. Thank you for this wonderful contest. I am SUPER excited to have found your website and to try out some of your recipes. I would also love to win your infusion water bottle. This would be great for try out all your recipes and infusing the water that I drink at work all throughout the day. Thank you Amy for creating such an awesome website and sharing with the rest of the world! Hello I am interested in getting the bottle, how do I purchase one? I really want to start but just don’t have extra money to buy a good bottle I would love to have one please. Thanks for the giveaway, it was helpful to me. I’m in the middle of changing my drinking habits from sparkling flavor water in a bottle to infusing my water because the carbonation is hard on my body. I’ve recently been diagnosed with a rare autoimmune disease so winning one of these would make it so much better as I go for my iv infusion treatments. Thank you for considering me for one of these. 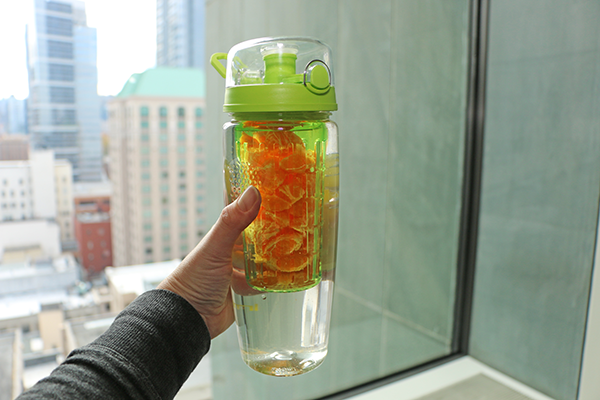 I just started an infused water regimen and winning an infuser water bottle will encourage me to keep my routine going. Thank you in advance. I was wondering where in Canada I can get your infuser water bottle as I’m on able to get it from amazon.com it doesn’t deliver to me. Just started infusing water on yesterday. Winning one of your bottle would be a big encouragement for me.